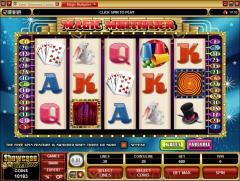 Magic Multiplier is a video slot game from Microgaming that has magic as its theme. But it is not the witches and wizards kind of magic that is usually found in slot games. Magic Multiplier features the kind of sleight of hand tricks performed by magicians on stage. The Magician holding trick cards is the wild symbol. There are three scatter symbols triggering three bonus games. These are the Hypnotic Wheel, the Cups and the Curtains. The other symbols also depict well known facets of magic shows. The Magician with Saw is in the popular act of cutting a girl. The Gloved Hands are showing a ball before making it disappear. Playing Cards, Hat and Wand and Rabbit are the other thematic symbols. High value card symbols from Ace to Jack also grace the reels. Players can enable up to 30 paylines. However it is advisable that they always wager with all paylines enabled because pay table combinations pay out only if they appear in enabled paylines. Players can wager up to 20 coins per payline and the coin size varies from 0.01 to 0.10. The Magician is the wild symbol and offers the highest fixed jackpot of 10,000 coins. The Wheel is a scatter symbol and offers scatter payouts when two or more appear anywhere on the reels. When three or more Wheel symbols appear then the free spins bonus round is triggered. 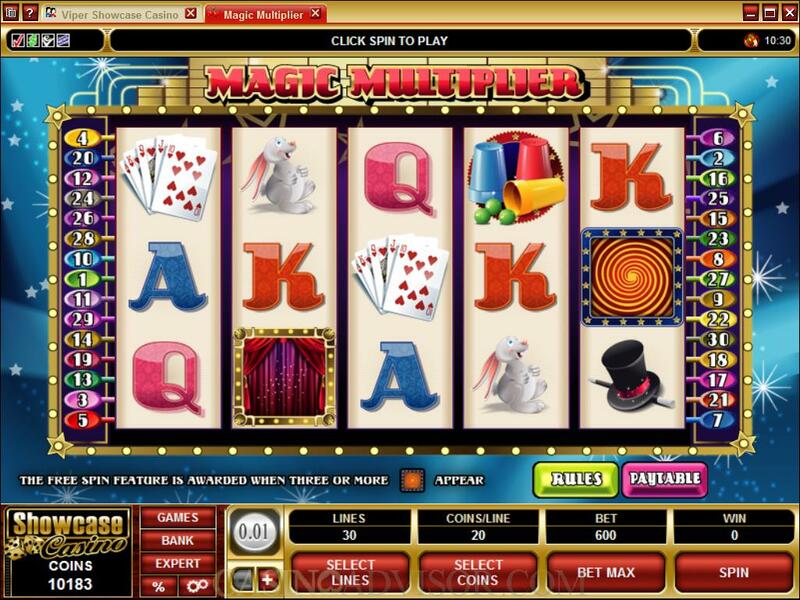 The Magician appears and reveals a random number of free spins with a multiplier of up to 5 times. The free spins can be retriggered, but at the same multiplier. The other bonus games can be triggered during the free spins but the payouts are not multiplied by the free spins multiplier. The Curtain symbol appears only on reels 2, 3 and 4. When three Curtain symbols appear they offer scatter payouts and also trigger the Curtains bonus game. This is played on the reels. The player selects one of the curtains, which open and reveal bonus credits. The player may be allowed a second selection if he is lucky. The Cups symbol appears only on reels 3, 4 and 5 only. When three Cups symbols appear they offer scatter payouts and also trigger the Cups bonus game. This is played on the second screen. This game replicates the famous act in which the magician hides the balls beneath one of the cups and the audience has to guess which one. The player has to make the guess in this bonus game. If he guesses correctly he gets bonus credits of up to 25 times the triggering bet. If he guesses incorrectly he gets a consolation bonus of twice the triggering bet. The player gets to play this game thrice. 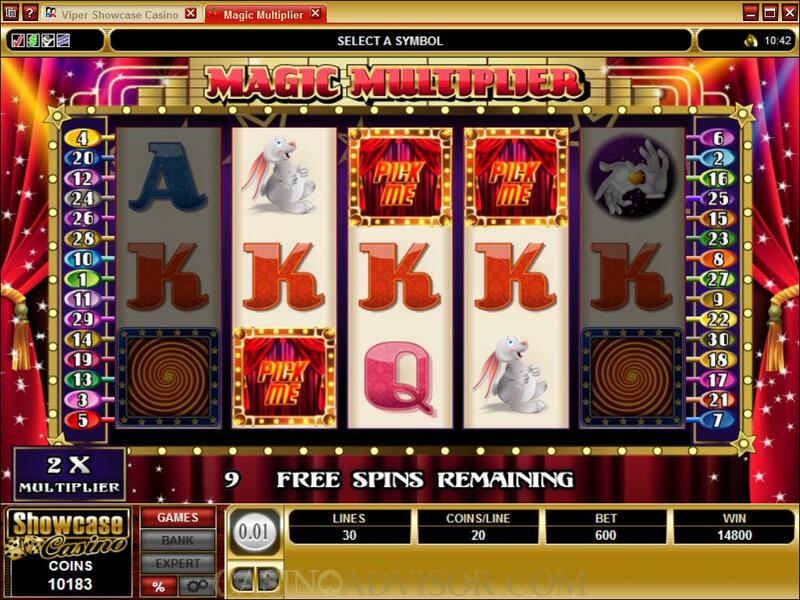 Magic Multiplier also offers the trademark Microgaming Gamble Game. Interested in reading more detailed information about Magic Multiplier? If so Click Here for more details.